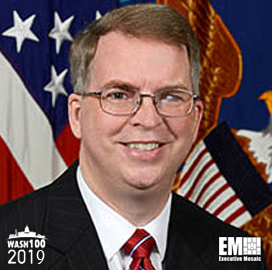 Executive Mosaic is honored to present David Norquist, acting deputy secretary for the Department of Defense, as an inductee into the 2019 edition of the Wash100 — Executive Mosaic’s annual selection of the most influential voices in the government contracting arena — for his leadership and handling of the department’s agencywide audit, finances and transition to the cloud. This latest honor marks the first Wash100 award for Norquist. The Pentagon spent nearly $1B on an agencywide audit of the DoD in November 2018, and the report revealed “a laundry list of problems,” according to Norquist. The audit was viewed as an opportunity for industry to offer solutions. Not conducting the audit would have been “a dangerous way to look at the world,” he noted. Norquist told Federal News Network that the department is conducting pilot testing to improve data, collect transactions and produce dashboard reports. The agency switched to systems that produce transaction-level activity, thereby creating potential for analytics that the department has not explored. Norquist announced during a Senate Armed Services Committee hearing in April that the department intends to provide lawmakers with a justification report outlining plans to acquire cloud computing infrastructure through a single-award contract. In March 2018, Norquist urged lawmakers to give defense officials more spending flexibility across three areas in 2018. Specifically, he asked them to loosen restrictions tied to the 80:20 rule, which prohibits federal agencies from spending more than 20 percent of their budget during the last two months of the fiscal year. Norquist possesses 29 years of experience in federal financial management. Before serving the department, Norquist was a partner with Kearney and Company. He spent eight years with the Department of the Army, five years on staff with the House Appropriations Committee and four years as deputy undersecretary of defense in the comptroller’s office. In June 2017, Norquist was sworn in as undersecretary of defense and chief financial officer. He served for nearly two years before performing the duties of the deputy secretary of defense in January 2019. Executive Mosaic congratulates David Norquist for receiving this award.